Classic case of trying too hard. I don’t think it’s trying too hard. I just think she has it right. Love her hair and minimal make up too. From the deep blue to the layers, I enjoy her style. I love the layering for fall, gives me some ideas of how to use pieces that have been sitting in my closet. I actually love this. 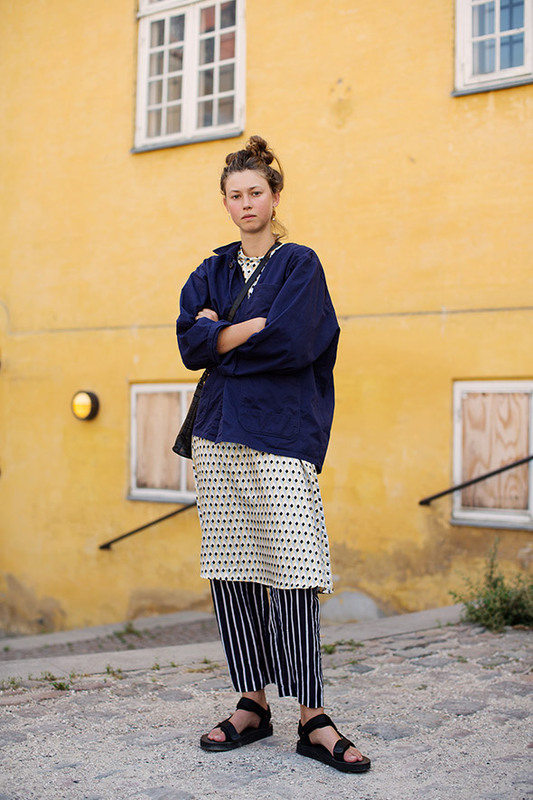 The patterns go so nicely with that deep blue rolled work coat. I love layering; colour, pattern and shapes. I also agree with Laurie, it makes many of the items in our wardrobes trans-seasonal. It has to be good for the planet when you make more of what you already have. Wait! Is she wearing the same top as the guy in the next post? Or is he wearing her dress? (Not that there’s anything wrong with that.). Just curious. Sart, are you messing with us? If you are, it’s your blog, so go right ahead. Just let the gent know : she wears it better. haha, spot on as always countyd! Sorry but I have to say that I don’t like the mix of colours, and diamonds and lines. But everyone have to choose his own style!. I really like the diamond shift , and the mix of colours /patterns work well together. Seems to lack balance… Somehow the lower part does not fit with the upper. But lovely lady!